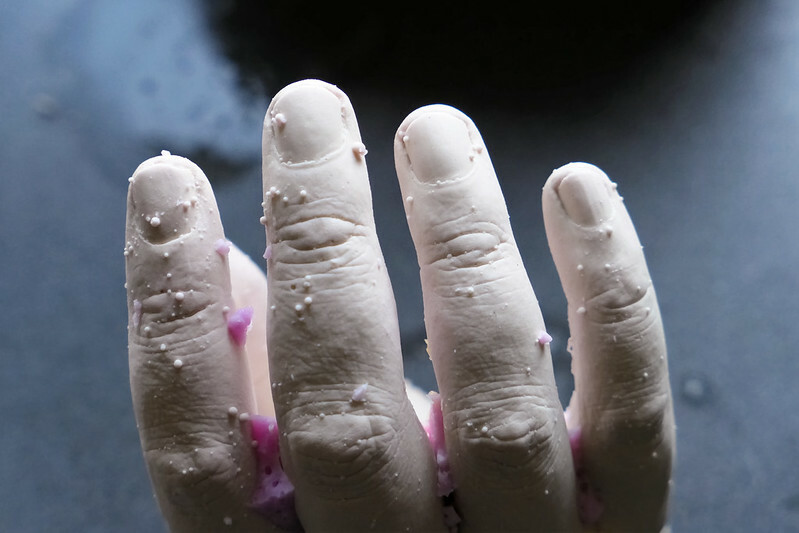 Today, I thought I’d have a go at casting my hand in plaster of paris. Obviously, this wasn’t a sudden whim because you need more than household ingredients to do this. I’d already bought several bags of Baby Rice alginate plus some mixing jugs that could serve as hand moulds. So, I mixed the first load of alginate, following the vids I’d found online and… IT SET! Goddamn thing just set pretty much immediately. I don’t know if it was how I was mixing or the water temp. So, I plopped that out of the mould – it was disconcertingly like a huge lump of flesh. Okay, batch 2, I’ll be more careful this time… Aaaanddd… aRGHhh, it’s all gone lumpy. LUMPY ALGINATE HELL! By this time, I was a little dispirited and the kitchen sink looked like I’d been murdering aliens in it. But I gave it one more go. This time, I probably didn’t put enough alginate powder in the mix, I was so scared of it going lumpy again. After a bit, I thought I may as well give it a go and I bunged my hand in and waited. Around ten minutes later (waaaay longer than it’s meant to take), the mould seemed solid so I gingerly wheedled my hand out. The plaster of paris was a piece of piss compared to the alginate. Mixed, poured, gave it two hours and then, ta-dah! The gallery at the top shows me excavating my cast hand out of the mould. I’ll let it dry out for a week or so and then decide how I’m going to decorate it. I don’t think I’ll go realistic… maybe a lovely gold? Or silver?